Health care projects depend on astute management of change. But more than anything else, they depend on leaders who pay attention, who understand the importance of starting right, and who know how to launch projects that succeed. If leaders can increase the percentage of successful projects, patients, and practitioners everywhere will be better off and so will the organizations that depend on these projects for innovation. 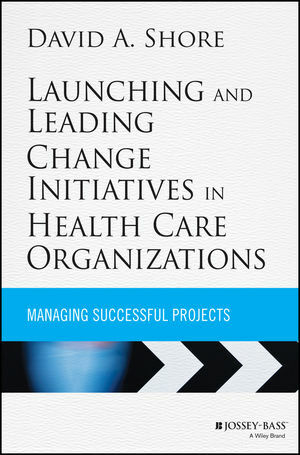 Launching and Leading Change Initiatives in Health Care Organizations gives leaders and managers the practical, easy-to-implement ideas and methodologies to start and manage projects successfully. DAVID A. SHORE, PhD, is former associate dean of the Harvard School of Public Health and founding director of the Program in Program Management. He is on the faculty of Harvard University and Adjunct Professor of Organizational Development and Change at the University of Monterrey Business School, Mexico. His previous book is Forces of Change: New Strategies for the Evolving Health Care Marketplace (also from Jossey-Bass).